Does Lindell's latest sound as good as it looks? Another classic hardware emulation that perhaps sticks to the original more rigidly than it needs to in some areas but sounds essentially identical to it. Authentic sound. Additional wet/dry Mix and HPF control. Fast compressor recovery time option. Looks the part. Continuous Attack time control would be good. Could sacrifice more authenticity for sake of modern usability. The Neve 2254 was introduced in 1968 as a broadcast compressor and limiter, and, following some modifications, the later 'E' version became a studio standard for its smooth levelling and thick, warm, rounded sound. It's the latter version that's modelled here by ascendant Swedish developer Lindell Audio. 254E (VST/AU/AAX/RTAS) is a faithful replica of the 2254E, although it does add the de rigeur wet/dry mix for parallel compression, and sidechain high-pass filter for the prevention of low-frequency pumping. It also expands on the original's functionality with a choice of fast and slow attack times for the compressor (matching the established design of the limiter), rather than one preset speed, and offers an expanded selection of release times for the compressor. The layout, from left to right, is metering, limiting, then compression. On the meter, the red numbers show the input or output level scale, depending on the position of the Meter switch, and true to the original, the meter is calibrated to +4 relative to the 0dB reference level. With the Meter switch set to Control, the black numbers give the gain reduction scale and provide a visual clue to the release time. Below the meter, the Limit Level sets the ceiling for the plugin's limiting action - turning it anticlockwise lowers the ceiling and thus increases the limiting - while the Limit Recovery knob sets the release time (100ms, 200ms, 800ms or Auto). The Gain knob only affects the compressor, and the Limit knob sets the limiter to fast or slow attack time, or turns it off. The Compress knob does the same thing as the Limit knob but for the compressor. To the right of that are the conventional compression controls: Ratio (1.5:1, 2:1, 3:1, 4:1 and 6:1), Threshold and Comp Recovery (release time - 100ms, 400ms, 800ms, 1.5s and Auto). 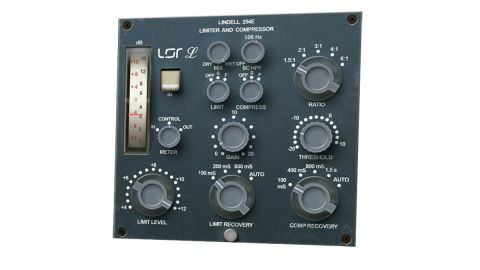 The beauty of the actual 2254E is the way it thickens, warms and glues the input signal without the unsubtle sucking and pumping side effects of many other compressors. The good news is that Lindell's clone does the same thing, equally transparently. The compression is subtle, even with fast recovery times, and you can push it heavily without causing much audible distortion, making it ideal for mix compression and keeping vocals upfront. Both attack time options are relatively slow, which makes it suitable for drums and other transient compression, too, particularly in conjunction with the Mix knob - although the results may be too polite for many people's taste. The limiting is just as transparent, doing an efficient job of holding the signal to the ceiling level without making it sound squashed. The original 2254E remains a sought-after classic, and this software model does a fine job of emulating it, getting the subtle colouration of its intrinsic harmonic distortion spot-on. The 'wow' factor is minimal, as it should be, and you need a good set of ears and a clear understanding of dynamic control to fully appreciate it. A great all-round leveller.